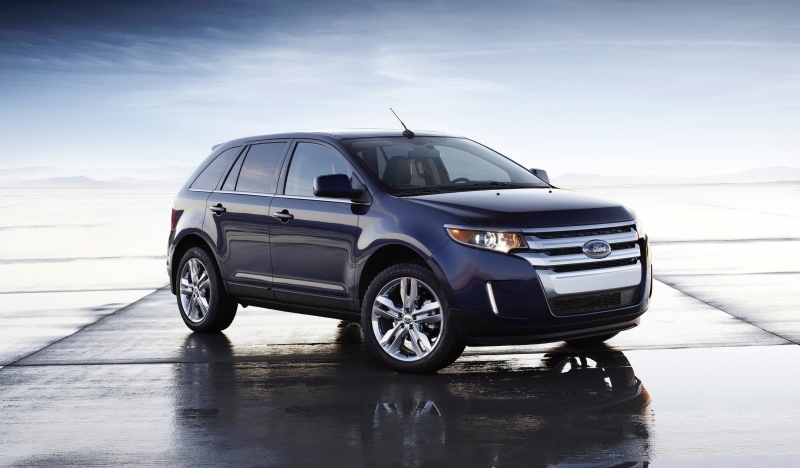 The stylish five-passenger Ford Edge has been a sales success since its 2007 debut, but time flies when you’re a midsize crossover SUV. With the competition launching new rivals left and right, it was time for Ford to rejuvenate its aging star. The first step was the 2011 stem-to-stern refresh, which added exterior styling enhancements and a much nicer interior, including the optional MyFord Touch electronics interface. Now, for 2012, Ford is doubling down with the introduction of the Edge EcoBoost, a fuel-sipping variant that’s powered by a 2.0-liter turbocharged inline-four. Yes, that’s four as in “four-cylinder.â€ The kind of engine you expect in a Civic or Cruze, not a two-ton-plus crossover. But it’s got a turbo, and check out the stats: with 240 horsepower and 270 pound-feet of torque, the 2.0-liter “EcoBoostâ€ delivers 17 more pound-feet than the base Edge’s V-6. It also yields an outstanding 21 miles per gallon in the city and 30 mpg on the highway versus the V-6’s 19/27 mpg. So what’s the catch? Well, if there is one, it’s the fact that the base Edge actually costs less than the turbocharged version. As with the larger Explorer EcoBoost, if you want that extra fuel economy, you’ll have to pay $995 for it. But a lot of people are thinking green these days, so the Edge’s latest makeover may be just in time. The Edge EcoBoost’s fuel economy is pretty much unheard of for a non-hybrid crossover SUV. The turbocharged engine is unobtrusive and pleasantly responsive. Thanks to that 2011 refresh, the dashboard looks fresh and upscale. 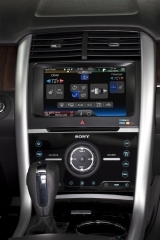 The optional MyFord Touch system provides ample connectivity and communications options. Unfortunately for snowbelt residents, the EcoBoost engine is only available with front-wheel drive. MyFord Touch guarantees daily geek-outs for tech types, but others may find its detailed, text-heavy interface confusing. The backseat may be serviceable, but it could use more headroom and under-thigh support. NHTSA crash test scores ranged between three and four stars out of five. The Edge EcoBoost is a fairly tall vehicle that weighs about 4,250 pounds, and it drives the part. Expect an unruffled freeway ride, good compliance over rough pavement, and handling that’s somewhere between indifferent and ponderous. 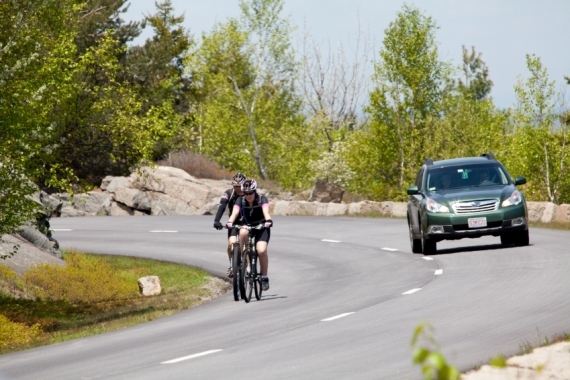 Road noise is rarely an issue, though wind noise around the windshield is sometimes a concern. The EcoBoost turbocharged engine does an exceptional impression of a non-turbocharged one, displaying none of the unpredictable power surges associated with older turbos—just a swell of refined power on demand, thank you very much. It sounds smooth, too; you’ll only notice it’s a four-cylinder engine if you’re listening for it. And while 240 horsepower isn’t much for all that weight, it should be enough—in concert with the prodigious torque—to make Edge-dwellers feel secure when acceleration is required. Under the hood of the front-wheel-drive Ford Edge EcoBoost sits a new turbocharged 2.0-liter four-cylinder engine rated at 240 horsepower and 270 pound-feet of torque—on regular 87 octane, no less. The transmission is a fairly responsive six-speed automatic. The EcoBoost engine does its work with surprising authority, especially at lower speeds, though the standard V-6 and optional 3.7-liter V-6 (Sport model only) are more competent. Towing capacity, an already meager 3,500 pounds with the regular V-6, drops to an insignificant 1,500 pounds with EcoBoost. The Edge EcoBoost gets a very healthy 21 mpg in the city and 30 mpg on the highway—that’s a smidge better than the Honda Accord V6, a much lighter family sedan rated at 20/30 mpg. There’s only one other non-hybrid five-passenger crossover that plays in the Edge EcoBoost’s league right now, and that’s the smaller Kia Sportage SX, which offers similar power via its turbocharged 2.0-liter engine and delivers 22/29 mpg in front-wheel-drive form. In addition to the MyFord Touch system discussed below, the Edge offers such niceties as reclining rear seatbacks (standard), dual-glass roof panels, and a power liftgate. Safety is a mixed bag, however. Although the Edge received a perfect crash-test scorecard from the Insurance Institute of Highway Safety, it faltered in the National Highway Transportation Safety Agency’s five-star crash tests, receiving scores of four stars overall and just three stars for frontal crash protection. 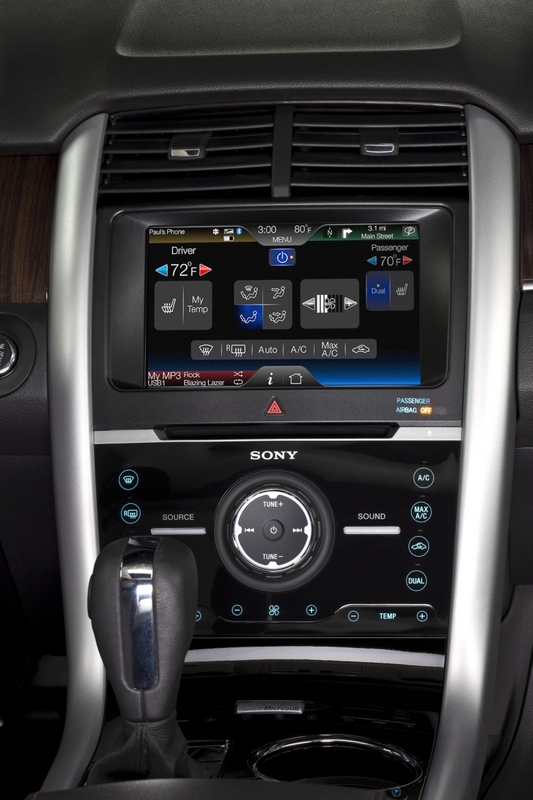 MyFord Touch, Ford’s optional eight-inch touch-screen interface, adds a laundry list of technological upgrades, including two customizable gauge readouts and voice-controlled connectivity for every imaginable portable electronic device. Unfortunately, all this cool stuff comes bundled with software that leans on word-intensive menus and commands rather than big friendly icons. We like MyFord Touch because of its immense capability, but we know some people don’t get a kick out of fiddling with the latest gadgetry. For them, simpler touch-screen interfaces like Chrysler’s new offering are better bets. 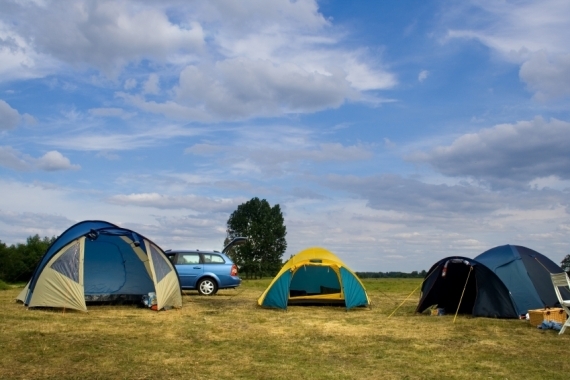 The Edge’s 2011 makeover transformed the cabin from afterthought to avant-garde. Dashboard materials are generally high quality now, and the overall look is sleek and sophisticated. We’re especially taken with the center stack’s appearance when the full MyFord Touch suite is specified—the button layout resembles that of a high-end home audio system. The backseat could be better though, due to lackluster under-thigh support and barely adequate headroom that shrinks considerably with the optional dual-pane glass roof. The Edge has always traded on its bold styling, and the 2011 tweaks brought the exterior up to date without losing the plot. 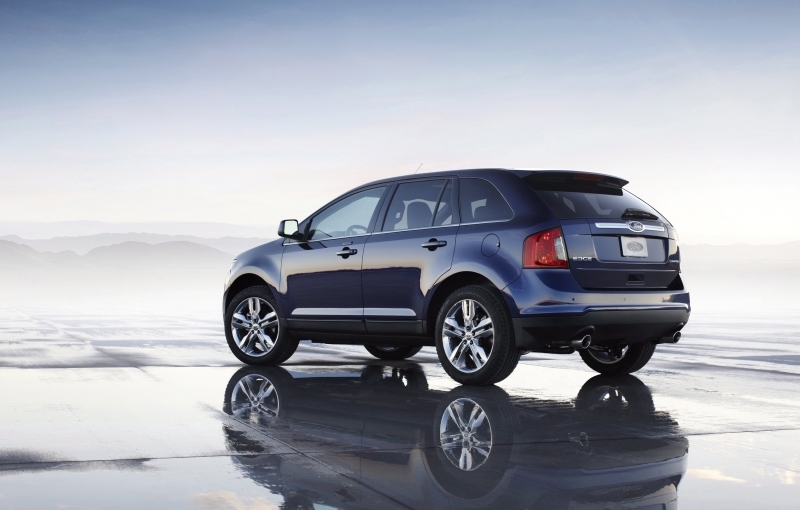 Style usually isn’t a reason to buy a midsize crossover, but it is clearly a winning aspect of this Ford. All things considered, the Edge EcoBoost’s closest competitor at the moment is probably the abovementioned Kia Sportage SX. The Kia is smaller, yes, but it can accommodate two adults in back nearly as well as the Edge, and it delivers comparable power and fuel economy for less money. The usual suspects in this segment—notably the Nissan Murano and Toyota Highlander V6—aren’t nearly as fuel-efficient. Consider also that the Explorer EcoBoost offers a third row of seating and more cargo capacity for about 500 bucks more, though acceleration suffers noticeably with the extra weight. 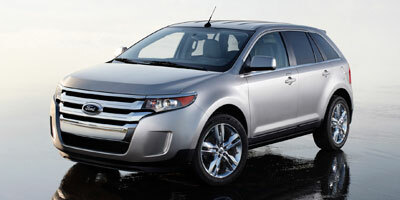 The 2012 Ford Edge EcoBoost starts at $29,460. The 2012 Ford Edge EcoBoost is easy on the eyes, great on gas, high-tech, and even moderately swift under the right circumstances. It’s a strong all-around choice as long as you don’t mind paying a premium for more MPG and less power.